Ad Aged: In olde New York. When you've lived in New York as long as I have and you travel around the city and its environs, you no longer see one dimension of time, you see two or sometimes three. Sometimes you see New York as it is today. Other times you see New York as you saw it when the world was very different, say 40 years ago, when you were young. 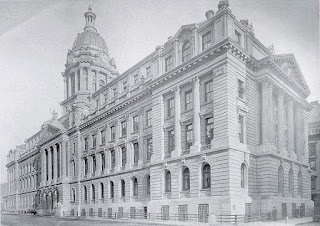 If you love the history of New York, as I do, you can see it as it was a century ago, or four centuries ago, or maybe even a milennia ago, before Europeans reached these shores. 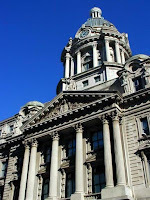 Last week I was called to Jury Duty at 111 Centre Street, the street employing the English spelling of "center," a nod to when New York was an English colony. I showed up at 111 early of course; I show up virtually everywhere early. It gives me some free moments to wander and look around. 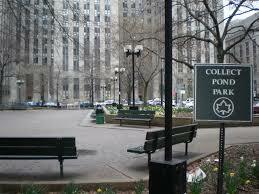 First, I noticed a park I had never heard of--though I'd been through this neighborhood one-hundred times. It's called the Collect Pond Park, and on the cold and windy Wednesday I was downtown, its three or four-acre concrete expanse was mostly empty except for blowing trash and desultory pigeons. 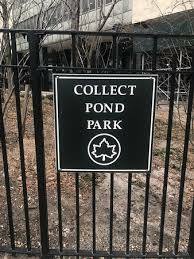 There's no pond in the Collect Pond Park today but 300 or 400 years ago it was Dutch/English-settled Manhattan's only source of fresh water. 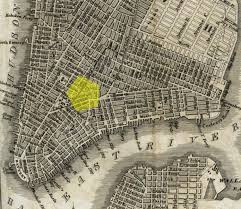 In short order, as New York's population swelled, local residents and local industry used the Pond not only as a source for fresh water but also as a dumping ground for all manner of offal and effluents. 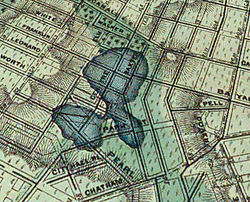 Tanneries and glue factories on the fringes of the pond would dump waste and horse carcasses into the water, fouling it, and leading to wagon-load after wagon-load of fresh water to be carted in from Deer Park, Long Island. Other New Yorkers gave up drinking water altogether and switched to wine, or beer, which presumably were not nearly as polluted. The city, as cities do, grew up around the Collect Pond. 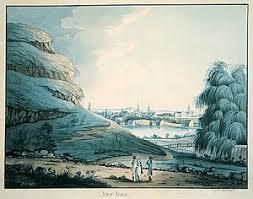 Before long, the city decided to fill in the filthy and polluted pond and built middle-class housing on the landfill. 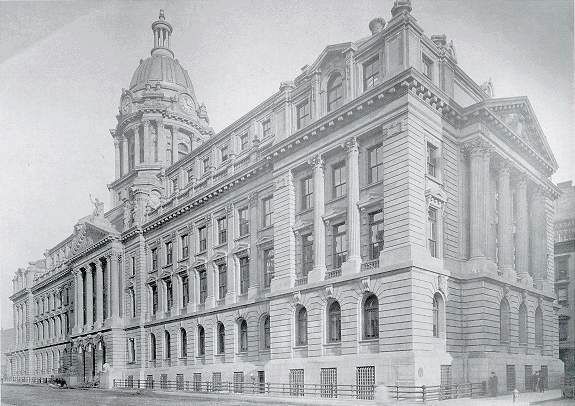 As is so often the case with government projects then and today, graft was involved in the job and the work was shoddily done. The land remained sodden and it would flood with water whenever it rained. Worse, centuries of dumping in the area meant that the area smelled all the time. 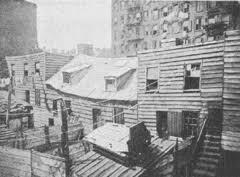 Soon, owing to the smell and the flooding, as well as huge influxes of poor immigrants to New York, the middle classes abandoned the area and it quickly became the source of the city's periodic cholera and yellow-fever outbreaks. 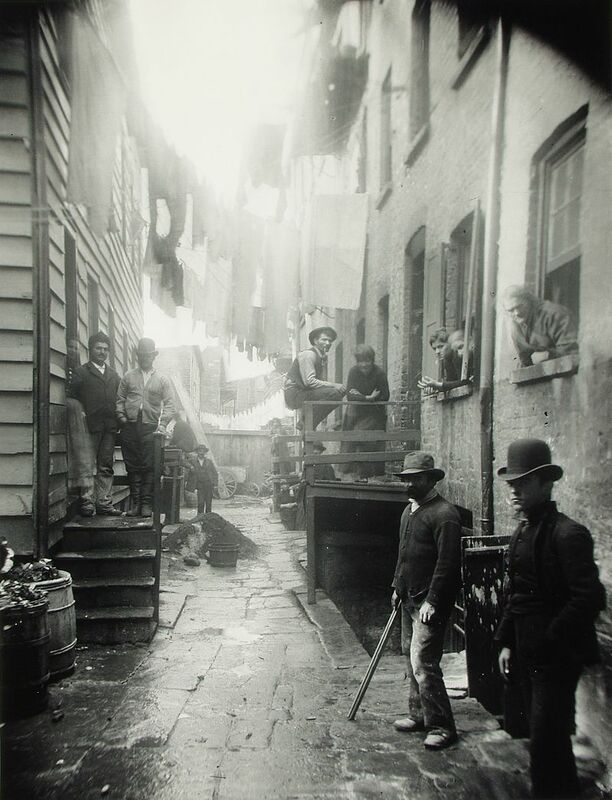 Soon it transformed into New York's most notorious, most dangerous slum, Five Points. Five Points--as a neighborhood--is no more. The "Bandit's Roost," off of Mulberry Bend, photographed by Jacob Riis in 1888, was slum-cleared, as so much of New York was. 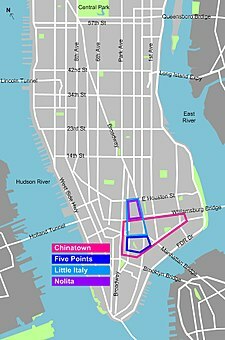 Today, almost the entirety of the area is made up of City and Federal courthouses, city government, and the ever-expanding Chinatown. 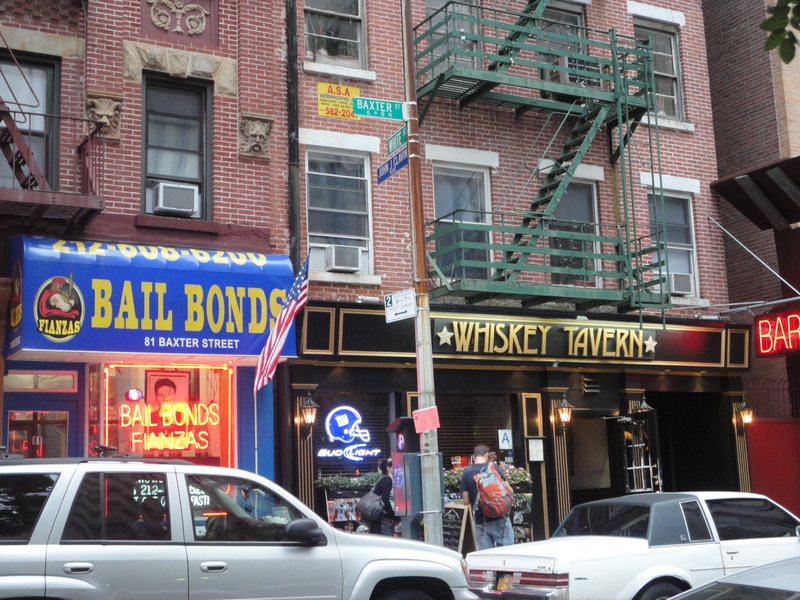 Due to the proximity to all those courthouses, on Baxter Street, one block east of Centre, there are still half-a-dozen or a dozen bail-bondsmen, mixed in among the cheap beauty salons and even-cheaper Chinese restaurants. About a six-minute walk from Baxter Street, you'll find at 183 Grand, just down the block from the old Police Headquarters (converted to condominiums about 30 years ago) you'll find John Jovino's, New York's last legal gun shop. You can't miss the sign, from it hangs a six-foot replica of a revolver that fortunately can't be hidden in a mugger's waistband. 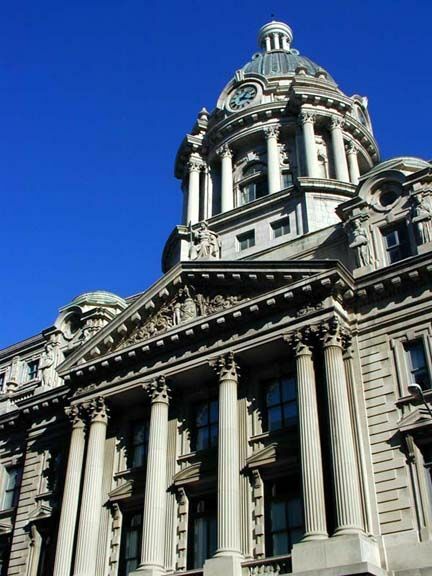 Jovino used to sell guns to much of the NYPD, but according to Wikipedia, not long ago, the Department opened its own internal firearms bureau. 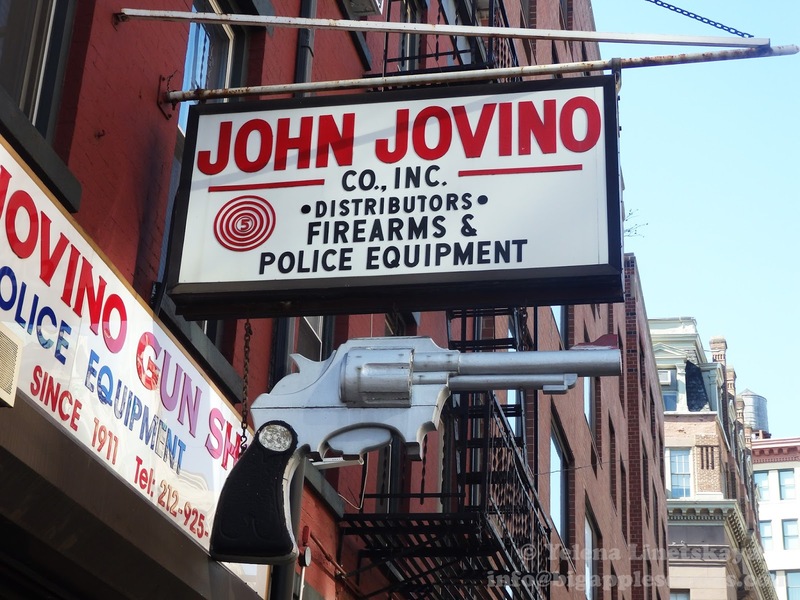 According to research conducted eight miles up-town at Columbia University, of the 11,700 guns used in crimes and traced in 2003, 102 came from the Jovino shop. In any event, the weekend was cold and sunny. But not so cold that I didn't head up to a nearby dog-beach in Connecticut. 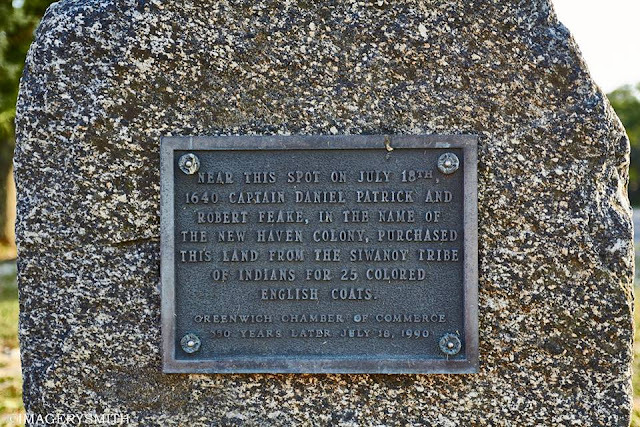 Before the English and Dutch, of course, Native Americans lived all throughout the New York area. The fact is the land was teeming with game and the sea and rivers rife with fish, lobsters, oysters and clams. I've read that Manhattan itself had more biodiversity, more trees, species of animals, birds, etc. before the Dutch arrived than Yellowstone National Park has today. Before New York was one of the world’s largest and most built-up cities it was a diverse, natural landscape of hills, valleys, forests, fields, freshwater wetlands, salt marshes, beaches, springs, ponds and streams, supporting wildlife and sustaining people for thousands of years before Europeans arrived on the scene in 1609. It was acclaimed by early settlers for its biological diversity and fertility: home to bears, wolves, songbirds, and salamanders, with fish, and porpoises and whales in the harbor. No one had ever told me anything about the coats. When a new boss arrives. Robert Caro and working hard. Five Minutes with Our CBO. Unbridled capitalism. And you. And me. "Ads that made me," by David Baldwin. Nobody asked me but….Early January edition.